An important part of being a parent is helping your children to find hobbies and activities that interest them. Helping your children to explore new activities to see what they like, is all part of helping them grow and develop into well-rounded individuals. While children are young it can be hard to know what types of things intrigue them, and where their passions and interests lie. The key to helping them develop their own hobbies and interests comes from encouraging them to explore the things that intrigue them. Don’t make any sort of commitment to a hobby before your child has tried it. For example, don’t pay out for three months worth of dance lessons if your child hasn’t had a taster session and confirmed that they enjoy the activity. Otherwise, you may end up with a dance hating child and three months worth of pre-paid lessons. If your child expresses an interest to try out a new sport or activity, find a class or session that allows them to take part in a taster session. This will allow your little one to get a feel for the activity and decide whether or not it is for them. Don’t invest in equipment, accessories and clothing for a certain sport or activity until you are sure that your child will stick with it for the long term. Even when your child is happy to stick at a certain hobby, only make short-term purchases. As, by the following year, your child may get bored. For example, don’t buy a musical instrument, rent it instead, buy sports gear from a discount store or it secondhand from other parents. As well as encouraging your children to take part in team sports and other active hobbies, like dance and hiking. Make sure to open their eyes to other hobbies that they can do at home, such as art hobbies, collecting an item, such as coins or model trucks, or caring for animals, for example. It is important that as well as taking part in hobbies with other children, that your child is also happy to find their own hobbies and activities to entertain themselves. Perhaps you could suggest that your child tries a hobby that you loved as a kid? Every child will find a hobby that they love. However, this may not necessarily be the hobby you expect. Remember, every child is different and not every child is made to be a dancer, an athlete or a musician. Each child has different talents; it is just about finding out where those talents lie. The more hobbies and activities your child tries, the more likely they are to find something they are good at and love. Thank you for the tips sis! We're excited to eventually expose our son to sports and other interests. We agree that it's not wise to invest on equipment if eventually your child lose interest in it. excellent guide to other parents! lovely shadow shot too! Lots of nice shadows here, Rose. This is such a sweet post. I love the photos. I also think it is very important to expose your child to many different hobbies and activities. I love that you are not pushing anything on your daughter and letting her make the decision herself. That is SUCH A good tip to not invest until you are sure. Sometimes hobbies and equipment can be SO expensive. I remember dance class as a kid required so many dresses and new shoes! What a flashback thinking of that. Thanks for the tips. I can't wait to see what my son decides to do! My nephew has been all over the place when it comes to hobbies. 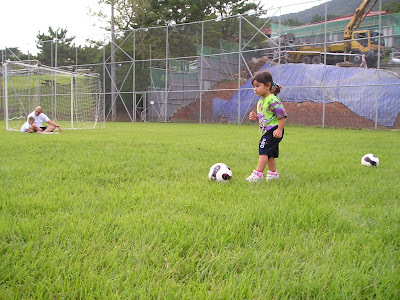 One minute, he is interested in playing the guitar while the next he showed interest in soccer. One thing that has remained constant is art and karate…he just won another trophy at a serious tournament this weekend. My kids have hoped around with what they like to do for fun! I love finding the little leagues that are shorter for them to try out for the first time. It’s hard to make a commitment when you they will just change their mind again. Great tips! Thanks for the tips on helping your child find a hobby. My toddler loves to paint and draw so I know this is one we will explore through art classes. I am hoping she continues to love it because she loves it so much now and enjoy her beautiful artwork. These are great tips! I have a five year old and he's always reluctant to try new things, so we sign him for mini-sessions of things to make sure he likes it first. Or we ask if he can have a trial before we commit. He tried Tae Kwon Do and now loves it and is starting TBall next week. These are such awesome tips! Being that my son is only two, I have about a year or two until he really gets into sports but I will keep this in mind! It's so true that you definitely need to think about everything and really have them test out the sport before paying to make sure they like it. Their little minds change so fast!